DESCRIPTION: ​This camp is open to Student-Athletes at all positions. 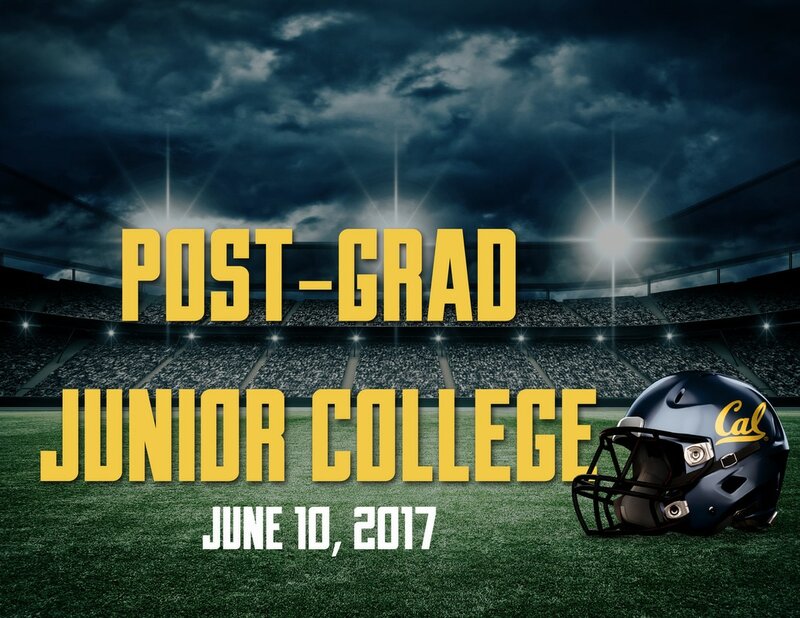 Junior College and High School post graduate Student-Athletes will have an opportunity to work hands on with the Cal coaching staff to refine their skills and improve their technique. Participants will train in the same facilities as the Golden Bears and be put through a series of drills the coaching staff uses at practice. This camp is for those who have completed their high school playing career. Each camper receives a camp t-shirt. This non-contact camp is designed to improve a player's beginning, intermediate or advanced skill level. Fundamentals of all positions on offense and defense are taught in addition to life skills such as respect, responsibility, sportsmanship, teamwork and the importance of education. The Golden Bears Football Camps are located on the beautiful campus at University Of California, Berkeley. The campus is located approximately 15-30 minutes from San Francisco and Oakland airports. Camps will be conducted inside Cal Memorial Stadium . Golden Bears Camp Check-In will take place in the North Tunnel of the stadium ( 1 Gridiron Way, Berkeley, CA 94720 near Gate 1) Check in starts at 3 PM. We must have a signed waiver packet on file for each camper. These forms are available at the "FORMS" tab on the camp website. If a parent is accompanying a camper at check in, you may complete the forms at check in. CAMPERS WILL NOT BE ABLE TO PARTICIPATE WITHOUT A SIGNED RELEASE OF LIABILITY FORM. Forms can also be faxed to our office prior to Friday, June 7 at 5 pm. (Fax # 510-643-9336). ﻿Professional certified trainers are available at all camp sessions. Each camper must be covered by his or her parent's medical insurance. A certified athletic trainer is on duty at all physical activities during the day. If your son is injured and needs to be taken to Emergency, we will attempt to contact you first. If we are unable to contact you immediately, your child's safety is our first concern and he will be taken to the proper medical facility. Please inform camp directors of any medical needs of camper that may need special attention and provide us with instructions. Please pack any medication he/she may need.